Announcing the winners of the 32nd ever Right Place Photo Caption Contest! Presenting the top 15 captions for this picture from AP Photo/Elliott Minor via Yahoo! #15: "Please tell me we are cooking rabbit!" #14: PAULA: "What was that noise?" JIMMY: "Oh, that. My pacemaker just made the garage door go up." #13: "I'd like a bite of them Georgia peaches!" #12: Jimmuh's thought bubble: "Mmmmmm, Habi-TATA's for Jimmuh-anity." #11: Most ex-presidents assume the mantle of elder statesman. 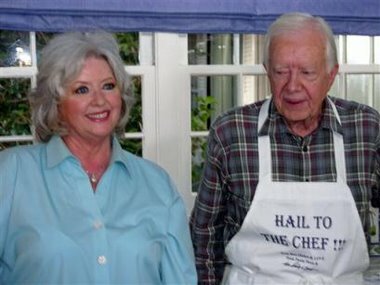 Jimmy Carter opted for short-order cook. #10: Jimmy Carter learned the hard way that chicks aren't as in to Nobel Prizes as he was promised. #9: "...And then, let the casserole cook at 350 degrees for 444 days..."
#8: Jimmy Carter is captured on television "lusting in his heart". #7: Mr. Carter then blamed President George W. Bush for the excessive use of Worcestershire sauce at the Fairfield County barbecue. #6: "Ya don't have ta call me 'Mr. President', Darlin'... you can call me 'King Leer'." #5: "That's right, Paula, all proceeds from my new cookbook, Dining with Dictators, will go to help Habiteat for Humanity... Er, I mean HabiTAT for Humanity. Heh." #4: PAULA: "No, you idiots, I said this recipe called for mayonnaise, not malaise!" #3: PAULA: "Jimmy, I love your apron! It says 'Hail to the Chef', which is very clever, but what does the small print say?" JIMMY: "It says 'Property of Hugo Chavez'." #2: Jimmy Carter reveals his recipe for failure: "Well, Paula, I just combine a couple of dollops of incompetence, a big heaping tablespoonful of spinelessness, and a half pint of stupidity, then - voila! - the one-term presidency!" #1: "How'd ya like to whack my rabbit?"